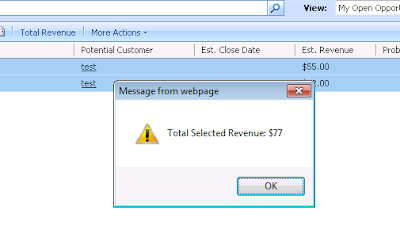 Next we initialize a total revenue variable that we will display to the user and then loop through the selected records. In the for loop above we will first grab the third index of the current selected record, which is essentialy the TR element of the grid. This button will present in all views. But how will it work if there will be no Est Revenue column, or it will be not on position 5. That is a good point. I think the default views for Opportunity have the column in the view and in the same spot which is probably why I didn't catch this. I will post an update for this to use the Web Service. Thanks. 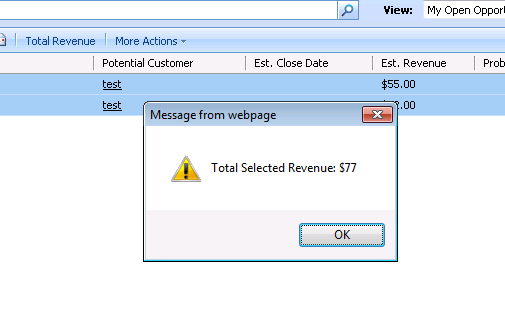 I updated it to alert the user if the column isn't in the currently selected view. Hi Blake, I tried this and got error at var headers = gridBar.getElementsByTagName('TH'); these lines , could u please help me in sorting this out?